What’s up guys, Shib here! Today, I’m going to be going through the most important things you’re going to have to know when you’re choosing your business name. It’s something that could be very emotional for a lot of business owners and for a lot of people is straightforward. The main thing, the two main things we’re going to be contemplated between is the domain and Google listing name. These two do not have to be the same things but there are some things that you should follow which makes it first of all favorable in search engines so it helps you rank in the search engines as well as for the long term you want to make brand able so let’s get into it. The first thing I’m going to talk about is the domain, “what domain are you going to choose?” So, just so we know the difference between the two guys the domain does not have to be the same as Google listing name. The Google listing name, if I can open my browser you can see, these are the business names these are the Google listing names that are coming up, right! This is your business name whatever you put in your listing name is going to be the business name, you’re going to be consistently true for all your other platforms, Yelp, Home Advisor whatever else you want to get into. 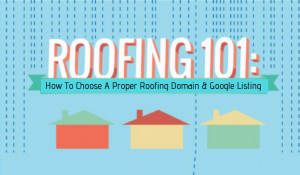 This name is going to be consistent so that is your business name but your domain name does not have to be a business name what I recommend the domain for your roofing website should be named the most search volume keyword or roofing keyword for your city. That is, you know available if you can get that and also if you can get the shortest keyword so let me show you what I mean if I go to the public data right now the Google Keyword Planner to find out what is it people are searching for when they’re looking for roofers around Brooklyn. The first thing I looked at Brooklyn, okay you see that this is a good keyword Roofing Contractor Brooklyn but there are 70 people; 70 people every single month search for roofers around Brooklyn using this one phrase. Not the best because it’s pretty long and we have better options compared to something like this roof in Brooklyn, it shorter and it has what almost five-six times more the search volume, right 480 people searches every single month. If we were to get out go out there and get roofingbrooklyn.com that would be a win okay, right off the back to say the least l will give you an advantage. Now, a lot of times it’s not available these kinds of domains get picked up a long time ago let’s say because; people know the value in this but not to worry not all the variations are picked up by the tool. For example, if you go to let’s say a different variation of this let’s say roofers Brooklyn you can see that also right around 480 search volume. It’s different than roofing in Brooklyn you know but it has still the same amount of search volume so you can go get roofersbrooklyn.com and just so you guys know there’s no ranking difference between .com, .net, .org. It’s just something that we have gotten accustomed to liking okay people like .com because it’s the most common one but in terms of actually ranking Google there’s no difference of whatsoever so roofersbrooklyn.com would also be just as valuable as roofersbrooklyn.com. Now, that we got our domain and I put that here roofingbrooklyn.com it’s short and has search volume, right! even if contractors Brooklyn had 480 search volume Roofing Brooklyn would be better making that clear. The next thing we’re going to be thinking about is Brooklyn roofer now this is where it gets a little interesting because back in the day and back in the day I mean even a year ago year ago 2016/17 up until then it used to be completely fine to go directly for your exact match domain name for your listing name. Meaning; if you are going for roofers Brooklyn for your naming your entire business exactly that roofers Brooklyn was fine but we are coming to realize now that there’s a high chance Google is going to crack down this on the future. It has happened with organic now it’s going to be left for Google to catch up for maps. Meaning that Google does not like when we are trying to gain the system by going for exactly the business that the most search volume keywords and naming our entire business after that. Right! it’s gaming the system and that’s not you’re that we chose that business name we won’t share because it has search volume and we’re trying to name everything just because of that. So, Google just does not like things when we do it just because of certain things in their algorithm. If you look at what is one of their biggest fears it is other companies, other people from other countries just creating these listing names and using the best lead generation websites. They’re not local businesses they’re somewhere else maybe not even in this country and they’re making these listings so that they can rank it up and when homeowners call they sell those leads to actual roofers and stuff. Google wants actual local business to be here so how do we get the best of both worlds because; once people started realizing this what they some people are doing they got afraid and they’re like “okay, I’m not going to choose anything that has to do with the business I mean the search volume keyword in the listing. ” For verzano that might be right, verzano contractors or I don’t know, verzano boys. Let’s say he calls his business horizontal boys now he’s going way too much in the branding side you could say or in other words, he’s just not getting any search engine value out of that name. He doesn’t have the word roofers in there he wouldn’t have the word Brooklyn in there it just for verzano boys, he’s going have some trouble, okay. Ranking against these current roofers which has roofing in their domain name in their listing name roofing in the listing and then roofing in the domain name etcetera, etcetera. So, how do you combat this? This is how this is literally the slam dunk best of both ways and that is by branding it. Just one or two keywords before the main search keyword okay and now it does not have to be in order so let me explain what I mean. Google listing name, let’s say you’re thinking about Brooklyn roofers, these are the two things you want to get in there your business name. You want to get the location and you want to get the service which is roofing. Guys, I’m just showing the best of both worlds, you don’t have to get location name all the time in there but I want to show you in a way where you can get it there and it still would count as branding and this is how. Number one; connect it to an emotional story, say for example your first roof you did was 8 1 2 Park Avenue blah blah blah and you want to make that your entire story about us. We started by getting our first roof done in 8 1 2 blah blah blah and that’s what we call ourselves we are the 812 Brooklyn roofers that will work 8 12 Brooklyn roofers now just imagine how brand able that is compared to Brooklyn roofers. Do homeowners over time remember all the time? ” yeah, I remember hearing about Brooklyn roofers in Reverse the whole thing about branding is you know not just some you up in there. We something that’s catchy, memorable for the community that they can every time they come across it it’s one more pile. It’s one more point in our name that they have seen us 8 1 2 Brooklyn roofers sounds pretty catchy a number to it okay and if you have a story that you also push it there with about me and all this stuff. Maybe you talk about when you go to homes that things add up guys over time that thing that those kinds of things matter branding is a real thing that you know goes a long way so that’s with an emotional story. The second thing we can choose from is trusted search, if you type in nationally what people search for just like you know Roofing Contractors you can see that there are other keywords that national has picked up that is not picked up locally. One of them is affordable roofer’s army, local roofers, trusted roofers are on me things like that right and you can go for one of those keywords that are and then act as if that’s your brand and that works completely absolutely fine. Trusted Brooklyn roofers, affordable Brooklyn roofers that is amazing if you are able to also get with a nice logo big A with cursive 08:16 just an awesome logo with that and that’s what you wrapping your trucks and everything you’ve got a business right there, that will work just fine. The last thing I would like to look at is personally one of my favorite ways to it is catchy and historic. Look at the name here Brooklyn Boys Roof, this is this is a different level because this is not just talking about Roofing Brooklyn this is Brooklyn Boys Roofing. This is the brand and then we’ll just have roofing in the end; Brooklyn boys I don’t know where it came from I think it’s from rap songs and things like that the point is it’s in it’s catchy in my head but means that it has made a historic difference. Right! Brooklyn boys we have heard this phrase before Brooklyn Boys Roofing it ends up getting the brand under the location in the site of the brand and then a middle word boys and then roofing I don’t know if I’m making sense here but this in my opinion, in my experience would be one of the best types of name structures to have. Brooklyn boys roofing for your listing name for your business name and with an awesome logo and all that stuff all the bells and whistles and then your domain name to go for the most search volume keyword ‘’Roofing Brooklyn’’. It will be good for the roofer SEO. This is the proper way to do roofer marketing when choosing a name and Google Listing for your business. So, hope that helped guys hope you got something out of it, hope I was clear I know I went to it very fast. if you have more questions please go down comment reach out to me if you’re a business which already has a name but you want to open a new location and you want to do it right this time and get the most you know brand ability and get the most on search engine value out of it this time with a new location. Comment below and I’ll help you out with how to configure that, thanks for taking time to watch this I look forward to hearing back from you guys soon, take care, bye.